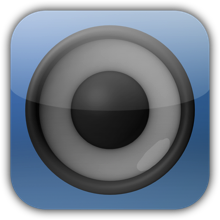 TouchMusic - Control your Music brings you a complete new way to listen to your music. It gives you easy ways to control your "Up Next" List. From now on you decide, what is played next. 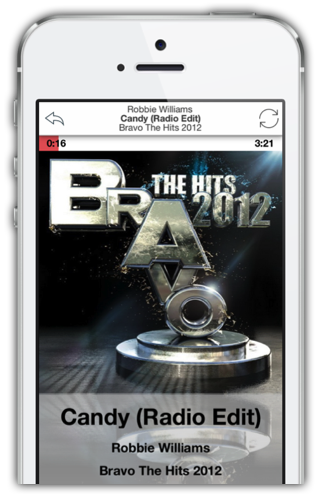 Handle your favorite lists for easy access of your current favorite Albums, Artist and Songs. It supports complete gesture based control, everything is easy to handle but very powerful. It also features great Artworks and an iOS 7 inspired Design, that gives you an early look on how Apps will look on Apples next system. See how "TouchMusic - Control your Music" simplifies your music experience and helps you to get more from your music. The "Up Next" List shows you the current playing song and the queue of waiting song. Editing this list a very easy task. To reorder the list just drag a row and move it to the supposed position. To delete an entry from the list, just swipe the row and the entry will be removed There is also a a button to clear the list with one tap. You can also switch the view to a nice cover art view, to do so just tap the button on the titlebar. To add new Songs to the List just swipe a row to get the context menu showing you some options. Here you can simply add a Song, an Album, an Artist and even a Genre to your "Up Next" List. 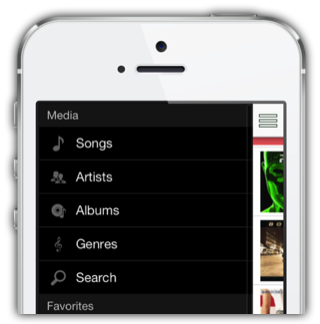 You can also add a shuffled list of an Album, an Artist or a Genre to your List. The last option its to add this Song, Album or Artist to your favorites list. This works in every list. 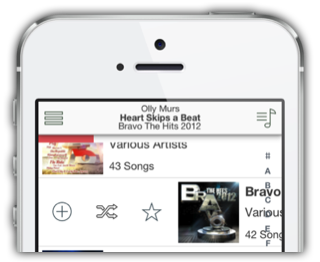 Control your music just with gestures, from everywhere inside the app. And you you learn how. To Play/Pause just double tap everywhere on the screen. To skip to the next song or restart the current one, just swipe left or right on the titlebar. To change the volume, just tap, hold and swipe up or down. And everything works everywhere inside the app. No need to switch to a NowPlaying screen or something like this. The Menu is moved to a hidden Sidebar. So it gives you more space in your lists to display the content. The Menu can be opened my tapping the left titlebar button and when you drilled down in some list, you can open the menu by swiping from the left side… Everywhere in your lists. Great Search Features. Just swipe down from the top of each list to display the search bar. With this you can easily search in every list, without leaving these lists. But you can also use the Search View for a textual search over your complete library for Songs, Albums and Artists. iOS 7 inspired Design. 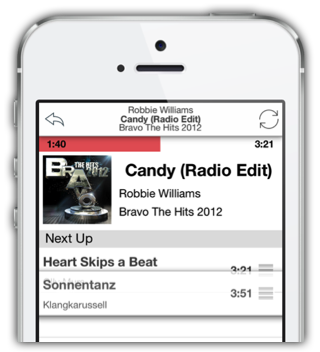 Take an early look on how iOS 7 Apps are going to look like? Here your are. The App uses a lot of iOS 7 inspired design principles and iOS 7 UI elements. Also you see great music artworks all over the app. Every list item brings you great artworks, every information you need and the items are large, with gesture controls in mind. Sharing your music with Facebook and Twitter. You can also switch on the scrolling of titles in lists to show you even longer titles in full details.